Normally, I focus on tech stocks but here we have a different animal. Amedisys is a healthcare company. It specializes in home healthcare and hospice services. Here are some snippets from the company's profile on Yahoo Finance: "Its home health services include skilled nursing and home health aide services; physical, occupational, and speech therapy; and medically oriented social work to eligible individuals who require ongoing care... It provides hospice services to patients using an interdisciplinary care team comprising a physician, nurses, home health aides, social workers, therapists, dieticians, volunteers, counselors, chaplains, and bereavement coordinators... As of December 31, 2008, the company owned and operated 480 Medicare-certified home health agencies and 48 Medicare-certified hospice agencies; and managed the operations of 4 Medicare-certified home health and 2 Medicare-certified hospice agencies in 37 states within the United States, the District of Columbia, and Puerto Rico." Amedisys is considered a small-cap; it has a market cap of $1.28 billion. The company seems to be incredibly undervalued. It's trailing PE is 10, it's forward PE is 9, it's PEG is a mere 0.54, price-to-sales is less than 1 and price-to-book is less than 2. The company's Enterprise Value/EBITDA ratio is roughly 6 which is low enough to be approaching the level of "deep value". As I mentioned above, the company is one of the growth leaders when it comes earnings. Year-over-year EPS growth is 53% though sequential EPS growth slowed down considerably in the latest quarter. Revenue is also growing, up more than 20% year-over-year. So those good EPS numbers are not coming from only cost cutting, there's top line growth going on here. The following chart shows it graphically. Finally, the company is cash flow positive and has no debt. Here we have the chart of daily data for Amedisys. You can see the stock has surged recently. MACD and Aroon are very bullish. Amedisys has bounced vigorously off its 200-day moving average and moved decisively above the 50-day and 20-day moving averages. The stock seems to be engaging in a textbook upside reversal. 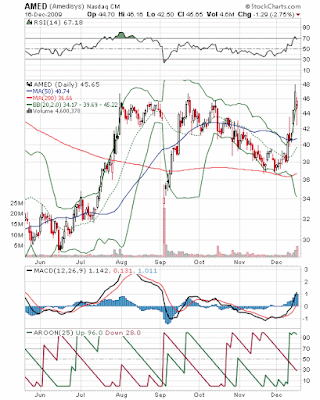 At the time of its last earnings report, Amdedisys reaffirmed its outlook for the year which ends in December. The trailing twelve month EPS is currently $4.53 and the company is projecting that 2009 EPS will be in the range of $4.75 to $4.90. Revenues are also projected to show an increase. In terms of analyst recommendations, Stifel Nicolaus upgraded the company from Hold to Buy at the end of October. The fundamentals appear to be terrific but there is considerable controversy surrounding the company. Citron Research has published a highly critical analysis of doings at the company. They point to sudden departures of top executives and note that investigations into Medicare fraud are ramping up and Amedisys has had numerous requests for documents from the government. To combat this kind of negative analysis, Amedisys engaged Marwood Group Advisory, a healthcare consulting company, to review its "procedures, controls, clinical infrastructure, corporate compliance processes, technology offerings and future strategies." Marwood essentially gave Amedisys a clean bill of health (no pun intended). So technically speaking, the stock is showing all kinds of positive behavior. Fundamentally things look pretty good, as well. The issue surrounding Amedisys is whether fraud will upend the company. On paper this company looks great. For some investors it may take a certain leap of faith to buy into the Amedisys story. Judging by the increase in volume as the stock has surged upward, though, there is a sizable number of other investors who are willing to put aside the negative rumors and just go with the momentum. Nice analysis. My view is that fraud risk is also mitigated by the large ownership and buy/sell ratio of reputable institutional investors. Rumours have been out there for quite a long time and Goldman, Thornburg and Fidelity chose to substantially increase their position last quarter. Are they ignorant?